VV9 Trailer | final from lerone on Vimeo. Two keynotes will extend the discursive field of Video Vortex #9: Beth Coleman > will re-engage local affairs with visions of networked activism, and Nishant Shah > will unpack video at the digital turn as object, as process, and as a symptom of the transnational flow of ideology, ideas and infrastructure, especially in emerging information societies in the uneven landscape of globalization. In the run-up to the actual Video Vortex event, international video correspondents have been investigating phenomenologies of video online. After 10 joyful years of global ubiquity, the conference will also engage with reinventions of the local under conditions of digital culture. A collaboration with the local video activist collective Graswurzel.tv >, whose activities are linked with antinuclear protests in Wendland (near Lüneburg), will explore mobile video in (alternative) news journalism. Artist Stephanie Hough > will join with local participants to oppose tracking and other incursions into our screen lives by turning a public square into a stage for a mass lip-sync. A liquid publication will go live as a sourcebook shortly before VV9 and continue to expand during collaborative editing sessions at the event in Lüneburg, ultimately living on as a multifaceted publication. Strahlendes Klima>, leftvision>, ViWuk (Videogruppe des Projekthofs Wukania), pappsatt>, filmArche>, Filmpiraten - filmpiraten.org Medienkollektiv Manfred>,… among others. Cornelia Sollfrank>: Giving What You Don’t Have.Artistic Research into Copyright-Critical Practice . High Tech Low Life. Screening am Scala Kino. 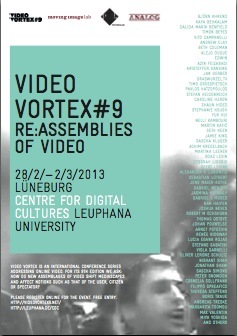 VV9 is organized by Leuphana University’s Moving Image Lab> and Post-Media Lab >.